I hope you are all having a lovely weekend, making and doing! If you read my recent post, you will know that my last cross stitch project is now finished. It’s time to move on to a new challenge. I often look for cross stitch projects on-line but rarely find what I like or want to commit time to doing myself, let alone see something that both me and Claire would like to do. Well she has come to my rescue on several occasions. Is it because she knows what I like? Or is it because she knows where to look for nice things? I don’t know the answers to those questions but what I do know is that there was much dithering, as usual from me, about what we will be stitching as our next SAL project. Then Claire emailed to say “How about this one?”. She even offered to buy two charts from America and post mine on to me which worked out much cheaper than ordering them separately and both of us paying shipping to England and France. She even paid for my chart as well but there is a catch. There’s always a catch . Claire doesn’t want me to pay her back in money. She is going to decide what crafting goodies she wants me to send her as payment of my debts instead. That suits both of us. Anyway, this is what we have decided to stitch. It’s by Whispered by the Wind and it is a cross stitch project that satisfies my love of quilting and embroidery at the same time. The chart looks great, really clear and quite large. 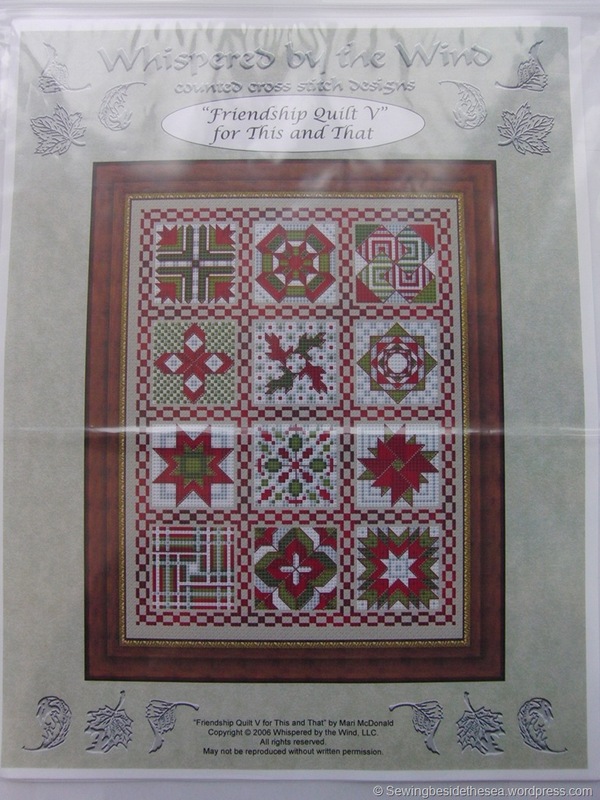 There are 20 quilt blocks to choose from so we have decided to stitch 5 x 5. I’ll be repeating some of the blocks I like best and omitting my least favourite ones. Claire is taking a slightly different approach which I’ll allow her to tell you about. Having agreed on a project, there was another problem. Which threads would I use? I am absolutely hopeless at making up my mind. With fabric for quilting I have no problems so I don’t understand my issue with threads. Anyway, this is what I have settled upon….sort of. I was going to stitch on black evenweave, using a selection of blue and purple threads but was quickly warned off by my OH. He correctly advised that the nights are getting darker earlier and that I wouldn’t be able to see very well to stitch, which in turn would mean that he would suffer my frustrations (although he didn’t actually mention that bit). So, the decision is made. 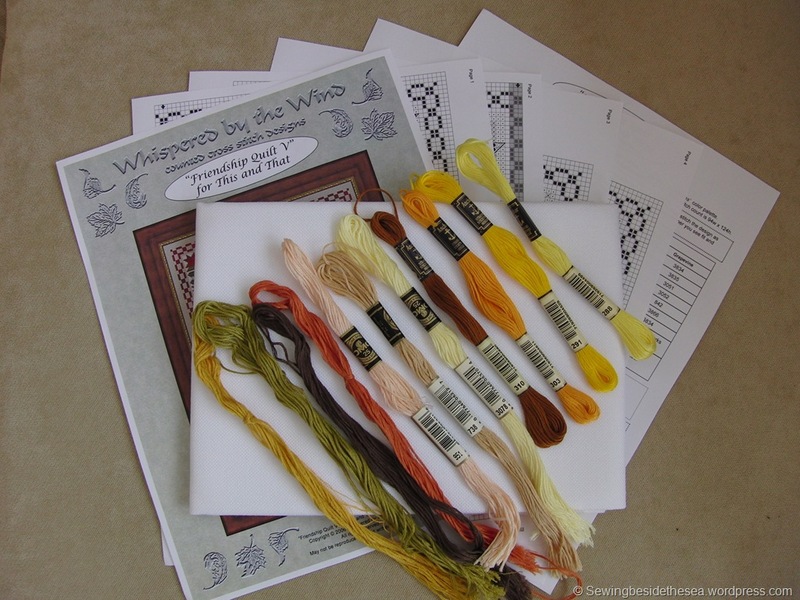 I’m going to use white 28 count evenweave fabric and autumnal coloured threads. I may not stick exactly to the group of threads in the photo as I have lots of other part skeins but it’s definitely going to be autumnal. The next bit is a repeated invitation to join our Stitch Along from my last post. If you’ve been following the progress of our other SALs, you’ll know that me and Claire tend to stitch the same project and Gun, Jule and Kate all stitch something else of their own choice. If you haven’t seen what they are up to, click on their names above. UPDATE: There are now nine stitchers in the group. If you would like to join the SAL, maybe to finish a WIP or to start something new, just drop me an email and then all you need to do is post an update every three weeks on the same day as us, linking to the rest of the group and show some progress. It can be as little or as much progress as you wish but it must be some progress . If you don’t have a blog but would love to join in, I’ll happily post a photo of your progress with my updates if you wish. My email address is at the right hand side of this page. You all know you have a project that doesn’t deserve to be left unfinished at the bottom of a drawer. It doesn’t even have to be cross stitch so you have absolutely no excuses. This is the way to get something finished. Go for it! Our next SAL update will be on 12th October 2014. Watch this space . We did it! Join us next time…. I agree with Jule, your colours are much nicer. What size are the finished ‘blocks’? It looks as if it might be a huge undertaking! Thank you 🙂 I’ve already changed the colours slightly but sticking with autumnals. That does look like an interesting chart. I’m wondering about joining in with my blackwork project. I’m stitching quite a large piece which is in a block of the month format (though I’m way behind) and I have been posting about it, so could I join in with that?